Turn two outlets on or off remotely from an app on your mobile device. This can be manual or scheduled automatically from anywhere at anytime. Four pivoting outlets accommodate plugs and adapters of all shapes and sizes. No sparks! Unwanted spikes in voltage don't stand a chance against Pivot Power Genius's 1080 joules of rock-solid surge protection. You’ve seen those pivoting power strips that can rotate in sections so you can fit multiple power bricks? Well, this App-Controlled Pivoting Power Strip goes a step further by allowing you to use your phone to control two of the outlets. 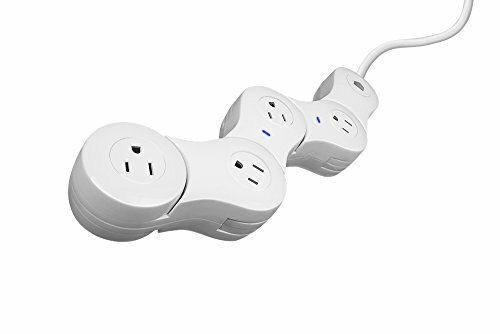 It bends to fit every sized plug or adapter without wasting a single outlet and allows you to independently control two outlets from your mobile device anywhere in the world via the internet. You’ll never wonder if you’ve left your lamp on at home again! You can even program the app to schedule when the outlets are turned on or off. How cool is that? It features four outlets but only two of them are switchable. That makes sense since you don’t want to accidentally turn off your cable modem, right? It would make controlling the power strip remotely kinda tough. Product Dimensions: 15.8 x 3.5 x 6 inches. Power Spike Rating: 1080 Joules.